You must have your documents certified (verified/confirmed/proved) by someone with the legal authority to say they are true and correct. 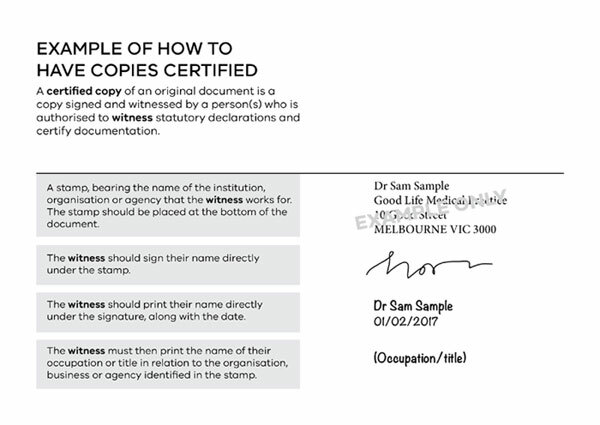 take the photocopies along with the original documents to an authorised person(s) for certification. Copies of documents submitted to the Overseas Qualifications Unit must be fully certified as shown below, including the signature of the authorised person. All documents must also be translated into English. You may be eligible for free translation services provided by the Australian Government’s Department of Social Services (DSS). This service is offered to people settling permanently in Australia – within the first two-years of settlement. You can apply online through their website. If you are not eligible for free translation services, an accredited National Accreditation Authority for Translators and Interpreters (NAATI) translator can be used.